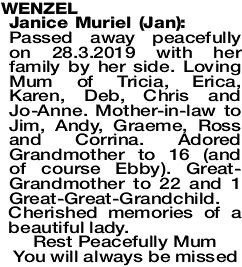 Passed away peacefully on 28.3.2019 with her family by her side. 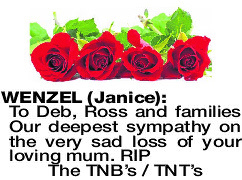 Loving Mum of Tricia, Erica, Karen, Deb, Chris and Jo-Anne. 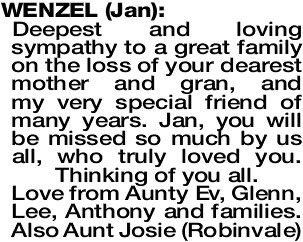 Mother-in-law to Jim, Andy, Graeme, Ross and Corrina. Adored Grandmother to 16 (and of course Ebby). Great- Grandmother to 22 and 1 Great-Great-Grandchild. Cherished memories of a beautiful lady. 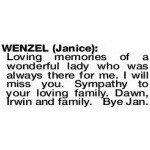 A Service to Celebrate the life of the late Mrs Janice Muriel Wenzel (Jan) of Bassendean will assemble at the main entrance of KARRAKATTA Cemetery, Railway Road, Karrakatta at 10.00am on FRIDAY (5.4.2019) for a Cremation Service. Loving memories of a wonderful lady who was always there for me. I will miss you. 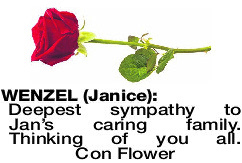 Sympathy to your loving family. Dawn, Irwin and family. Bye Jan. Deepest and loving sympathy to a great family on the loss of your dearest mother and gran, and my very special friend of many years. 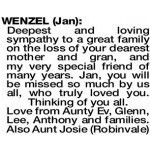 Jan, you will be missed so much by us all, who truly loved you. Thinking of you all. 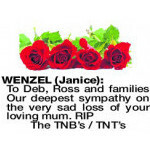 Deepest sympathy to our dear friends Erica and Andy, also to Michelle and Rick, Luke and Katie and to all the Wenzel family. Wendy and Wes Ager, Michelle, Lorenzo, Jane and Jake.